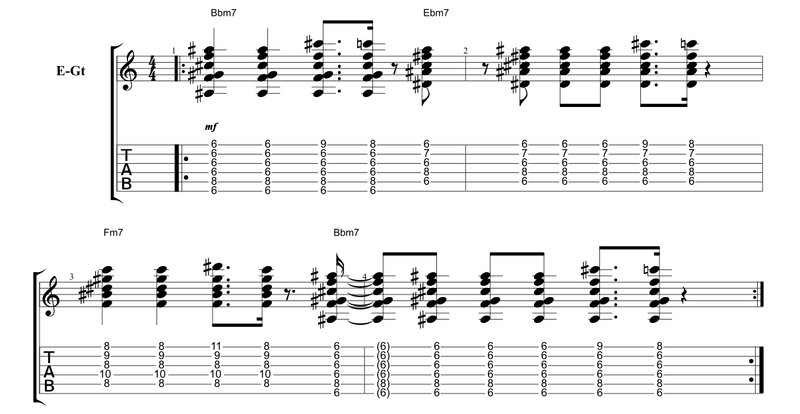 In this lesson, we are checking out three funky barre chord licks. Throughout the last few lessons, we have increased the number of notes we are using each time. We started off with one, then worked our way through double-stops and triads, today is the turn of the barre chord. As always make sure you move all these ideas into different keys, and play along with your favourite funk drum grooves. Nile Rodgers makes yet another appearance here in example one. 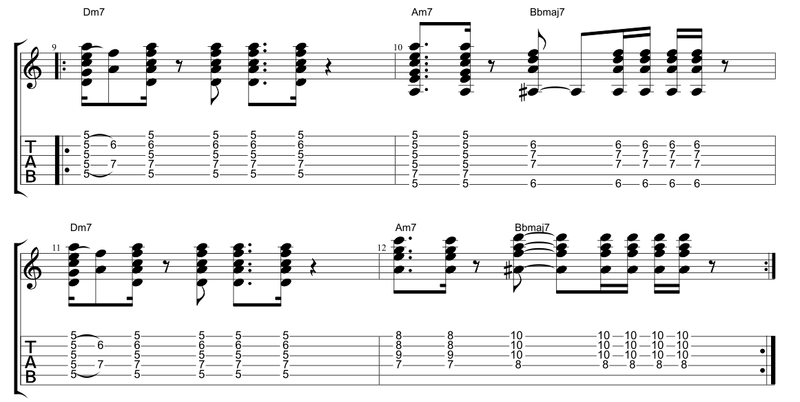 This lick centres around Bbm but cleverly uses notes on the high ‘E’ strings to add a melodic element to the lick. This is a great time to work on your little finger dexterity. Make sure you have your barre chord is firmly pressed into the strings so you don’t create unwanted muted strings. I love being able to use one type of chord and create a groove from it. In this case we are using major 7th chords in different positions. This lick is clever because you have three different versions of a major 7th chord using the ‘A’ ‘D’ and ‘E’ shape varieties. Keep your strumming hand consistent throughout. When you add techniques such as hammer-ons and pull-offs to funk barre chord patterns, they instantly become alive. This example shows how you can create a pattern but alternate the position in which the chord shapes are played. The first time through the Am7 and Bbmaj7 are played in their position one ‘E’ shapes. The second time through they are played in the position two ‘D’ shapes to add variety. Funky! Hi everyone, Simon here once again for Fundamental Changes. Today we’re looking at our Introduction to Funk Guitar part 6, where we’re going to discuss bar chords. Let’s go and have a look at some of those ideas, just after this. There was our Example 1. This one is based around B flat minor, or B flat minor 7. Bar chords in funk are always going to have a little bit more to them than maybe the normal progressions that you might be used to. This B flat minor 7 here is our 6th fret E minor shape, but you’re just going to drop off your little finger. What that allows you to do is your little finger is now doing a few notes on the high E string there. You’re getting the 9th fret and the 8th fret to give it quite a melodic line to your bar chords. Then we carry than on, we’ve got the E flat minor 7, which is your 6th fret,A minor shape minus the little finger again. Lo and behold, this guy is then doing the similar things on the top string once again, 9th and 8th frets giving you the flat 7 and making the 6th there as well. Then we move our minor 7 shape up 2 frets to get the F minor 7, and this time we’re just using the 11th fret with our little finger. The little finger there, taking it off from our normal minor bar chords has allowed that finger to be free to create almost a melodic part that might back a vocal or something like that. The wonderful Nile Rodgers used to do this a lot with his work with people like Chic. That gives you a really new way to mix up your bar chords. Let’s go and have a look at Example 2. There was that quite jazzy funky part, almost reminiscent of guys like Nile Rodgers, once again, George Benson, lots of people use this idea. The thing I like about this idea is we’ve got a D major 7, which is our 5th fret. You’re going to have nothing on the 6th, 5-7-6-7-5, so you’re barring all the way through the 5th fret. That creates a triangular shape major 7 there. Then we’re going to have our G major 7, but in the D shape. You’re going to have 5 on the 4th, and then barring 7-7-7 with your ring finger, 3rd finger if you like. Back to your D major 7 where you started, and then we have a G major 7 once again. We’re using 2 different shapes of the same chord, but this shape is our E shape: 3, nothing, 4-4-3, nothing. Some quite cool ways there, keep your picking hand consistent, nice and funky, sliding in that G major 7 in the D shape there. It takes a little bit of practice because you’re sliding 4 different notes, but sounds really, really funky. Let’s go and have a look at Example 3. There was our Example 3. You can start to add in some specialist techniques, even to your bar chords: slides, bends, hammer-ons, pull offs, vibrato, etc. Now, bends and vibrato are not particularly easy to add into a bar chord, let’s face it, but hammer-ons and pull offs, and sliding in, definitely, absolutely, fantastic sounding. At the start of this lick, we’ve got our D minor 7. Again you can see the similar shapes coming up throughout this now, same shape you had earlier on in Example 1, A minor 7, B flat major 7. You can see that all of those chord shapes we’ve used previously. The second time, we’ve got A minor 7, but in the D shape, which is going to be 7-9-8-8. You can bar the 8-8 with 1 finger, I was taught it this way. I actually prefer to use separate fingers. The advantage of barring of course, is then you’ve got your little finger free to do some other free notes, which I generally recommend, but often people get into that shape and it sounds a bit – not so great. Then you’ve got your major 7 once again on the top strings, you can see the shapes repeating themselves. The important bit that sets up this whole groove is you’ve got a double hammer-on on the D minor 7. You’re going to hammer in from the 5s, to 7 on the 4th, and 6th fret on the 2nd, which is your D minor 7. So, start to use these grooves, leave fingers free so they can create some melodic notes on their own, and try to create your own patterns, wherever you’ve got a chord, even if it’s just a stock major or minor bar chord. Try and adapt them now to be the 7th counterpart, minor becoming minor 7, major becoming major 7 if you can. If that doesn’t sound right on the major, try making it a dominant 7th. Remember, there’s only 3 main types of chord grouping: major, minor, and dominant. Those 3 chord shapes there will set you up well. If you don’t know your dominant chord shape on the 6th string, it’s going to be your E shape bar chord minus the little finger. That’ll give you something to work on there too. Hope you’ve enjoyed this introduction to funk part 6, I’ll see you next time for way more funky videos. Take care. Hi everyone, thanks for watching this Introduction to Funk Guitar part 6. I really hope you got something from it. Make sure you go and check out Joseph’s new book Funk Guitar Mastery on Amazon, and you come and have a look at my channel, SDPguitar for way more free guitar videos to inspire you wherever you are in your guitar-playing journey. I’ll see you next time for more videos. Take care.